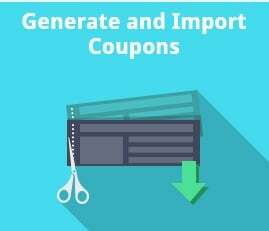 Amasty offers several reliable coupon-related extensions such as Special Occasion Coupons or Multiple Coupons, and today we describe another useful solution called Generate and Import Coupons. 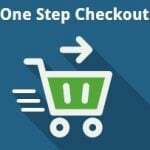 With this Magento 2 module (there is the Magento 1 version as well), you can dramatically reduce the time necessary to generate and import multiple promo codes. The Amasty Generate and Import Coupons Magento 2 extension allows doing this in a couple of clicks. Furthermore, the module provides the ability to track coupon usage, so you will always know how your promo codes are utilized. Another important feature is related to affiliates: you can export an unlimited number of coupons to provide your partners with them. The Amasty Generate and Import Coupons Magento 2 module enables you to create multiple coupons per each cart price rule, so there is no need to spend hours of time recreating the same cart price rule to get the necessary amount of codes for a promotion. Alternatively, you can rely on import. Simply take a CSV file with promo codes and upload it into the system within a few clicks. Thus, you will rapidly assign multiple codes to a particular cart price rule. Note that templates for promo code creation are customizable, so a unique template can be used for each new promotion. We describe this aspect in more details in the backend section. 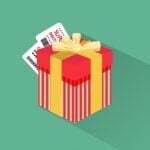 As for Groupon-like and affiliate features, Amasty Generate and Import Coupons allows merchants to generate and export coupon codes for partners. Besides, you can view stats related to their usage. To manage coupons, go to Marketing -> Promotions -> Cart Price Rules. Here you can see a grid with all cart price rules. 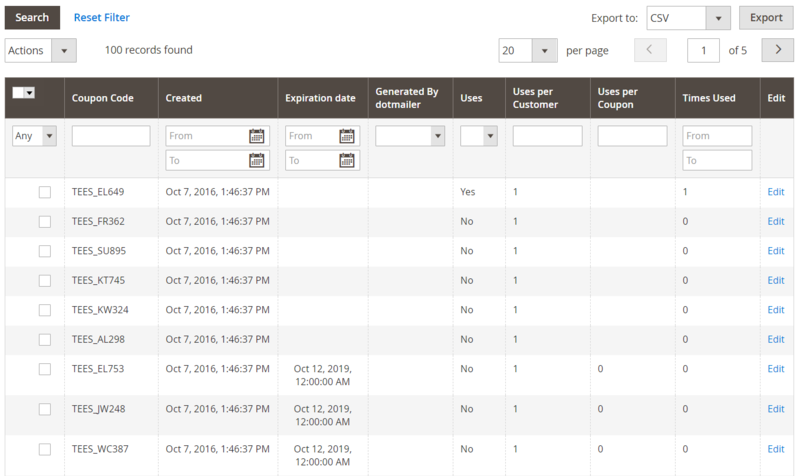 Click on a rule to explore the functionality of the Amasty Generate and Import Coupons Magento 2 extension. You will be redirected to a new screen with rule information and settings. There are 5 blocks of options here: Rule Information, Conditions, Actions, Labels, and Manage Coupon Codes. Click on the last one. It is divided into 3 sections: Import Coupons, Generate Coupons by Template, and Generate Coupons. Besides, there is a grid with existing coupon codes. In Import Coupons, you have to choose whether to delete the existing coupons or mix them with newly imported codes. Next, select a CSV file and hit the “Import” button. 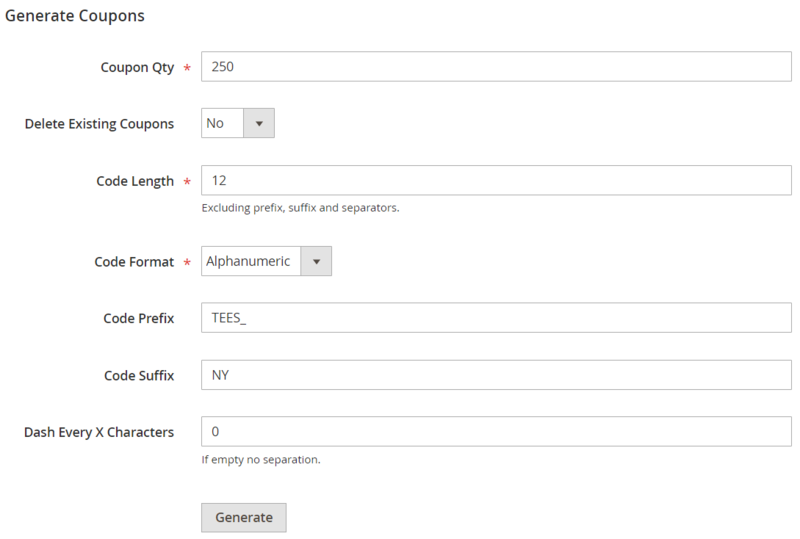 Generate Coupons by Template allows you to specify the number of new coupons, decide whether to delete the existing codes or not, and create a template using “L” for letters and “D” for digits (you can add other letters, but note that “L” and “D” will be replaced). The Generate Coupons section includes more options. Here, you specify the quantity of codes to be generated, choose the destiny of the existing codes, specify code length (excluding suffix, prefix, and separators), choose a code format (alphanumerical, numerical, or alphabetical), add prefix and suffix, and choose the density of separators. Then, hit the “Generate” button. As for export, it can be performed from the grid which you can see below. CSV and XML are two available formats. The Coupon Usage Report screen shows all necessary data in the grid that illustrates a rule name, coupon code, track number (if it is available), order number, grand total, status, and date and time of purchase. Besides, you can view order details via the link from the Action column. Now the imported file is removed even if import failed. Now it is possible to edit coupon properties from the coupons grid.